Why are Preppers so Angry? 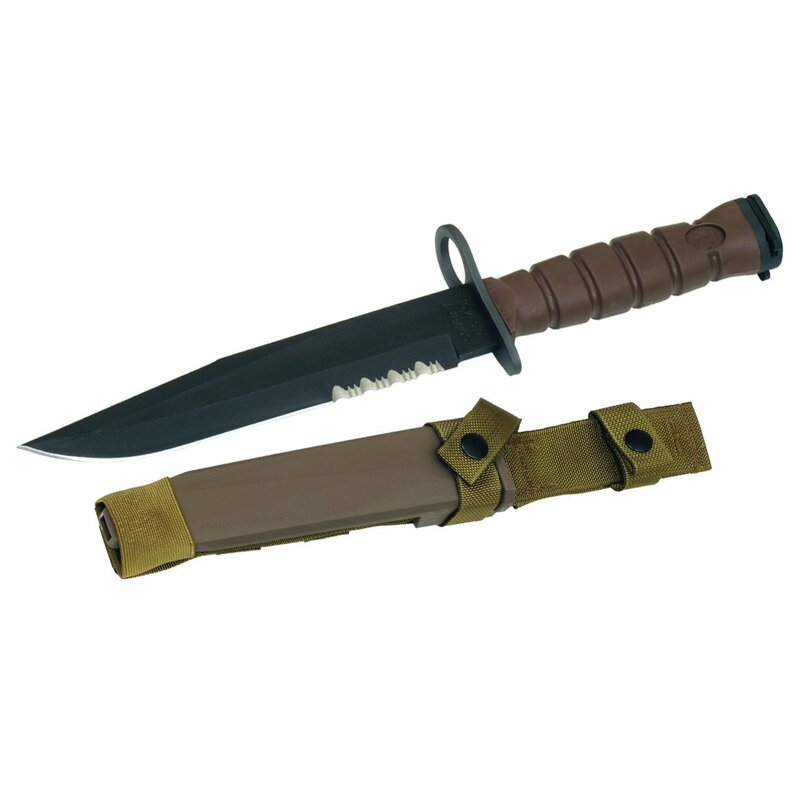 The Resuce tool, like the Soldier, both have serrated main blades. There is a noticeable amount of confusion regarding serrated and plain edge knives and it’s clear after watching a few youtube clips and reading various forum posts than most people don’t understand why serrated edges work the way they do. Lets go through some basic concepts so as to understand both of them better. This is simple enough. With the edge of a knife you can cut by either pushing directly against the material you are trying to cut without moving the knife laterally or you can push against is while moving the blade, dragging it across once or moving it forward and backward in the direction of the blade. Examples of push cutting could be shaving, whittling wood, make a featherstick, chopping wood and chopping some vegetables for dinner. When you cut a steak, when cutting through tough cordage, or slash away in a knife attack these would be slicing cuts. This equation holds the explanation to most of the advantages of the serrated edge knife. Why does the tip of a knife pierce? Because the tip of a knife has an incredibly small area of contact, creates a lot of pressure in a very small area and easily pierces most soft materials with a moderate amount of force. The same thing happens with serrations. The area of contact is very small given that the tip of the serrations are a much smaller area than the contact area of a straight edge knife. The tips of the serrations work like tip of knives, and with little force they manage to pierce and sink into the material. This is why in general serrated blades perform well against tough, hard materials (hard plastic, wood) compared to plain edge knives. At the same time unlike slicing, when push cutting the total area of contact in the same section of material will be greater in a serrated blade than in a plain edge knife. Imagine you have a thin thread following the full extent of the serrated edge, going into every depression. If you could straighten that thread the total length would be greater than the same length of edge per inch of knife blade compared to a plain edge knife. There’s less area of contact so that’s why, under the same physics principle, when push cutting once the tip of the serrations penetrate the serrated blade wont push-cut as well as a plain edge knife. The deeper the serrations, the greater the total area and the worse it will push-cut. 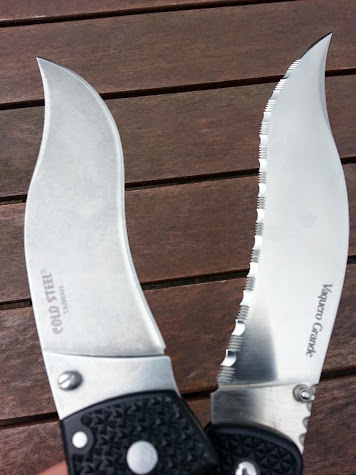 Now, while the serrated edge knife is clearly not as good as the plain edge for push cutting, we did say the serrated edge will penetrate better initially given the smaller area of contact of the tip of the serrations, so what happens when instead of push-cutting we slice, moving back and forth? Here, another principle of physics comes into play. With any knife, you need to apply force against the material you are cutting, but because of Moment = force x distance, the length of the knife works against you. In fact, when Archimedes said that with a long enough lever he could lift the world, he was absolutely right. The same unfortunately happens with knives: The longer the blade and greater the distance, the more force you will need to cut through…. Unless you have serrations. 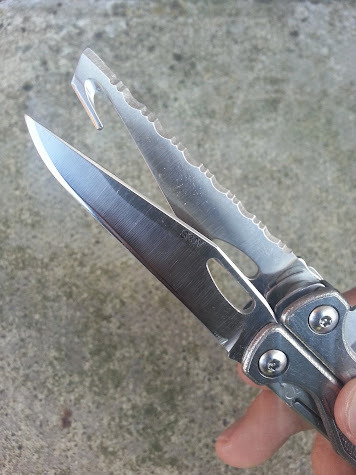 Because of the geometry of serrations, once the small tips penetrate and you apply lateral moment, you are not using friction alone, you are catching the material within the small curvature of the serration, transferring the force directly in the path of the material itself, working like small hooks . On an equally sharp knife, this is much more effective than just using friction and applying extra force to beat the leverage. Now that you get it, what does this all mean and how does it translate to the practical world? Well, first we already understand that (on equally sharp knives) serrations will just slice better out of pure physics and geometry. Its true that very sharp knives slice very well, especially in soft materials, but then these are usually sharper than the serrated knives they tend to be compared with. A very sharp, plain edge knife will also become dull faster during practical use. We see this a lot on dinner plates which being made of ceramic take away the edge of a sharp knife very quickly. This is why in general you will see kitchen “steak” knives with serrations being more practical and found more often in kitchen drawers. The tip of the serration makes contact with the plate, making that tip dull but preventing the inner curvature of the edge from coming into contact as well. When cutting soft food, the dulled tip of the serration will still dig in deep enough so as to reach the sharper edge on the inside of the curvature and with a little lateral movement it cuts right through it. Because of this a cheap serrated edge tramontina will survive in a kitchen drawer for years and still cut beef, while a 100 USD fancy pants steel knife with a plain edge will become fully dull because of ceramic plates in a matter of days. This same utilitarian side is applicable in other fields. That’s why you often see serrated knives being used in emergency response personnel and most military knives have at least part of the edge with serrations: Even with somewhat dull knives, with brute force serrations are more likely to slice through whatever needs cutting. In the case of defensive use knives we have to keep a few things in mind. First, serrated and plain edge knives will pierce equally well, with a slight advantage going to plain edge knives as the serrations are more likely to catch and increase friction as the blade penetrates. When it comes to slashing the serrated edge has the advantage of catching the material and biting while plain edge knives have a greater chance of slipping away when there’s tough material involved (for example leather jackets) At the same time you may not want a knife to catch so much when fighting because there’s more of a chance of it slipping away from you hand. In a worst case scenario, tired, maybe even blood ending up in your hands, it could slip away if the blade catches into the fabric when slashing with force. Having said this, not all serrations are made equal and some are better than others. For years I carried a serrated Cold Steel Vaquero and it would cut through leather like butter although serrations plus recurved edge may be too much. 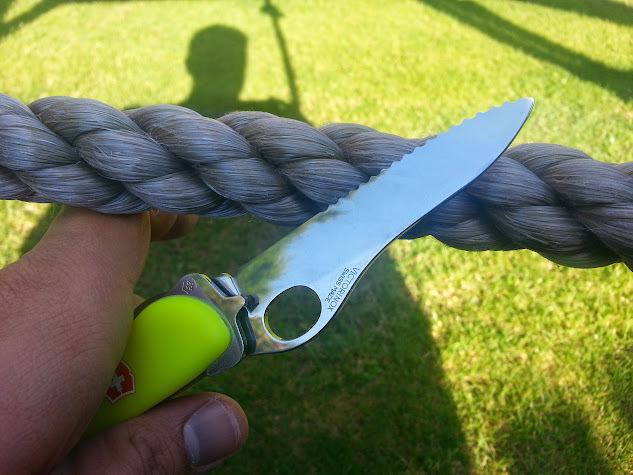 I find that the recurved edge blade combined with a plain edge works even better and safer, an ideal combination in my opinion. The recurve blade means the knife will dig in nicely when slashing, yet if it doesn’t cut into for whatever reason it just slips away, which is a better outcome than losing the grip and dropping the knife. The Cold Steel Vaquero Grande folder (a steal at only $36.45 right now in Amazon!) is still the folder I recommend the most for defense. While the serrated blade clearly has advantages it can be a bit harder to sharpen and you nice, controlled cuts are more difficult or even impossible to make in some cases. For utility purpose knives the serrated blade has a clear advantage, but for those that know how to keep a blade razor sharp a plain edge is still capable of slicing very well, with great control, and allows for more detailed work. You only need to remember to keep it as sharp as possible so as to overcome with sharpness some of it shortcomings compared to serrated blade knives. Fortunately, with multitools such as the Leatherman Charge Tti, you don’t have to chose and you can have both. What if I help and get sued? They probably deserve it anyway. “You’re not supposed to defend yourself, sweetie, call a teacher if someone is bullying you”. “Fighting back is not accepted in this school, young man” says the principal. “Fighting back is not accepted in this society, mister” says the politician. You own a gun????? For Defense???? What gives, you think you’re Rambo or something???? I’ve seen these in airports and hospitals, schools and malls. Even some gyms have them now. 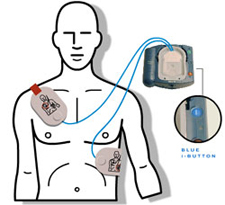 You probably don’t own an autoated external defibrillator (AED) and neither do I. At age 35 and in good health I don’t feel the need to rush into buying one. Hopefully by the time I’m 45 they will be a bit cheaper! But the simple matter is, an AED is most likely to save your life than any other "prep" item you own and that's just a fact yet how often do you read about it in survival articles? At a thousand bucks they sure are expensive, but most folks wont even blink about spending more in a couple guns and some ammo. 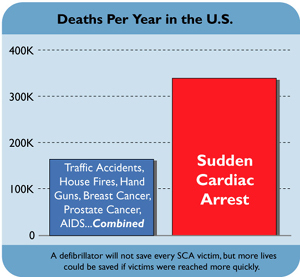 For every minute without CPR and defibrillation, the victim’s chance of survival decreases by 7-10%. Preppers and survivalists typically live away from cities. Living away from cities means living away from emergency medical care in most cases. If it takes an ambulance 10-15 minutes to get there, chances are you’re a goner. An AED saving your life is FAR more likely that any gun, survival knife or other tool doing so but they cost a thoudand bucks, and most important, they just arent as cool as guns. 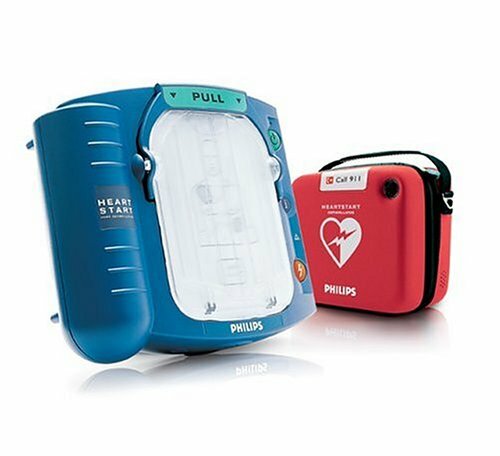 The AED is simple to use. It detects and only delivers shocks when required.